Bathroom ceramics - as noble as velvet and silk. Keramag Silk bathroom ceramics fulfill the highest standards of design and comfort and moreover are best suited for an exclusive furnishing of a hotel. Ranging from the small Keramag Silk 40 x 29.5 cm hand wash basin and 57 x 42.7 cm wall-mounted wash basin to the large Keramag Silk 120 x 47 cm wash basin with 2 tap holes, Keramag Silk offers everything what is needed in a comfortable bathroom. All ceramics are available with the easy-care KeraTect. 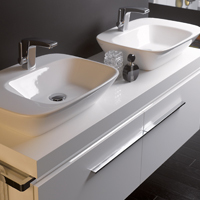 Visually, Keramag Silk WCs and bidets impress with a sophisticated design. Thanks to the Keramag Silk wash basin combined with the corresponding Keramag cabinet and a Silk mirror, you can ensure a comfortable and sophisticated atmosphere in your bathroom.